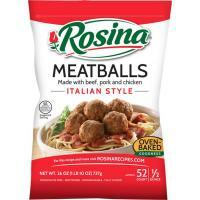 A lot has changed at Rosina since 1963, but maintaining consistency and quality in our meatball recipes has stayed the same. Our Italian meatballs offer a fresh, authentic Italian taste. Made with premium, high-quality ingredients, just like Grandma makes.